Partly as a result of policy neglect, production from small gas fields in the Netherlands has dramatically declined in recent years, a fact that so far seems to have escaped public notice, writes Jilles van den Beukel. Dutch gas is effectively being replaced by Russian gas, he notes. 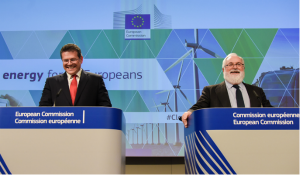 According to Van den Beukel, this is not in the best interest of the Netherlands or of the EU, neither from a financial nor from an environmental point of view. He warns that if no measures are taken, we will see a rapid and near complete collapse of gas production from Dutch small fields. Gas production in the Netherlands, the EU’s largest gas producer, has always rested on two pillars: the giant Groningen field and numerous small fields, many of them offshore. The rapid decline of production from the Groningen field over the last few years – the result of caps put in place by the government to limit seismicity – has received a lot of attention. However, what has escaped most people’s notice is that production from the small fields is also rapidly declining, albeit for very different reasons. For decades the Dutch government has stimulated the production from small Dutch gas fields. 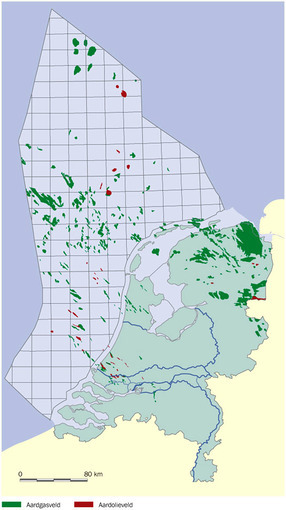 The aim of this successful “small fields policy” was to maximise revenue from Dutch gas and at the same time preserve the Groningen field as much as possible. Prior to the year 2000 the production from small fields (both offshore and onshore) exceeded 40 billion cubic metres (bcm) per year – the equivalent of France’s annual consumption. After 2000, a gradual and slow decline started to set in, which was compensated by increasing the production from Groningen. By 2007, small fields production had decreased to about 35 bcm and fell below that of Groningen for the first time in decades. By 2012, production had decreased to about 30 bcm. Until this time the decrease was solely due to geology. The early (larger) finds started to deplete and later finds gradually decreased in size. In recent years there has been a marked change in the operating environment for Dutch gas production. Until that time Dutch gas was generally seen as a welcome source of revenue for the Dutch government, obtained from the production of a relatively clean fossil fuel. After 2012, gas came to be viewed more negatively – as a polluting fossil fuel that was only suitable as a ‘transition fuel’ on the way to a decarbonised economy. The increasing realisation of the severity of the climate change problem and the increasing momentum to actually start tackling this problem, culminating in the Paris COP21 Agreement. The increasing magnitude of earthquakes in the province of Groningen and the plight of people affected by these earthquakes, culminating in the 2012 earthquake near the village of Huizinge that damaged thousands of houses. This damaged the public image of gas in general and the image of the largest producer NAM (a joint venture of Shell and ExxonMobil) in particular. The increasing unpopularity of large corporations such as oil and gas companies, perceived to make profits at the expense of local populations. All this was a gradual development, but if I had to pick a turning point I would place it in 2012. 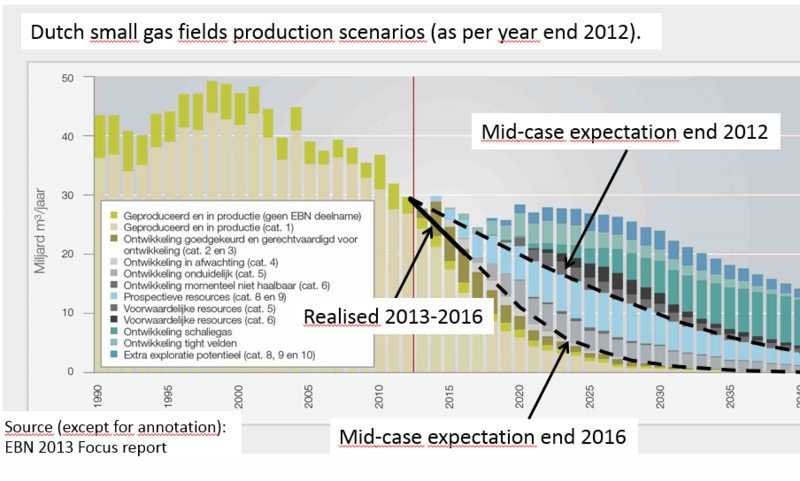 The figure below shows the production from small Dutch gas fields until 2012 and the potential scenarios for future production at this point in time. A large range of scenarios was possible (depending on future gas prices, the amount of government support for small field production and the success of several exploration plays). What has so far materialised is a scenario with a very low production from small fields. This decline is more severe than in the past and is no longer just related to geology. Obtaining a permit for onshore drilling has become a very tedious and time consuming procedure; obtaining a permit for a new onshore production location has become virtually impossible. With regard to this last point: a decline in offshore gas production can have a snowball effect. If an increasingly smaller number of fields have to carry the operating cost of the entire offshore pipeline system, at some stage the moment will arrive that this is no longer commercially feasible. This means that more gas will be left in the ground in the end. That moment is now rapidly approaching, especially if gas prices continue to stay low. As can be seen in the chart, the difference between the current and the late 2012 mid-case production profiles is about 170 bcm. Depending on future gas prices this represents a value of some €15 to 30 billion (primarily to the Dutch state). I would estimate that by now roughly half of this volume has been irrevocably lost; half could still be saved if adequate measures are now taken in a world where oil and gas prices are slowly recovering. The public discussion on this issue has, however, been minimal. Since the energy transition will take many decades, with gas consumption in the Netherlands declining only gradually between now and 2050, the current rapid decline in gas production in the Netherlands has major repercussions. Dutch gas will be (already is) replaced by Russian gas and/or coal. That is not in the best interest of the Netherlands or of the EU, neither from a financial nor an environmental point of view. It means that dependence on Russian gas will increase, public finances will be hurt and most importantly, emission targets will be more difficult to achieve, certainly in the short and mid term. Coal is the most polluting fossil fuel. 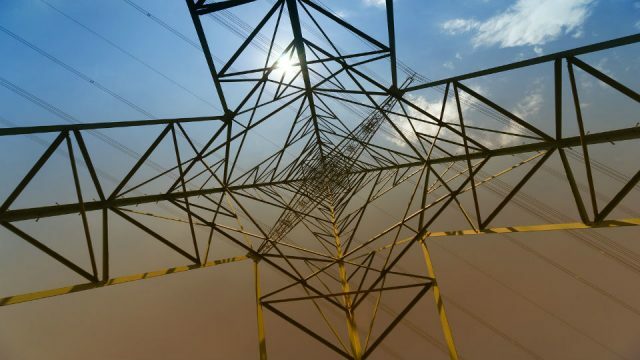 To limit coal used in electricity production will require costly additional measures. The use of Russian gas leads not only to additional CO2 emissions (roughly 12% of the gas is needed to transport gas from Russia to The Netherlands due to the low efficiency of the Russian gas transport system), but also to more methane emissions, as methane losses from transport over large distances in Russia are almost certainly significantly higher than methane losses from short-distance transport in The Netherlands. 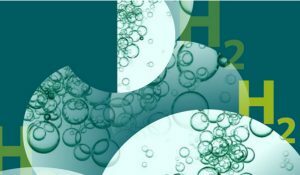 Methane is a much more potent greenhouse gas than CO2. Total greenhouse gas emissions (CO2 equivalent) from Russian gas are estimated to be about 20-25% higher than from Dutch gas. To conclude, the policies that are currently in place are grossly inadequate to preclude a rapid and near complete collapse of gas production from small fields. It would make sense for the government to stimulate the production of remaining gas reserves, e.g. through preferential tax treatment for small fields or fields with low quality reservoirs. The Dutch tax regime for gas producers is significantly worse than for instance the tax regime in the UK (50% versus 30% direct tax take). Part of the revenues could be used to fund a much needed, but also costly and lengthy, Dutch energy transition. Jilles van den Beukel worked as a geologist, geophysicist and project manager for Shell in many parts of the world. This paper was first published on his blog JillesonEnergy. On 11 November 2016, the Dutch government published a “Draft vision subsurface” (“Ontwerp structuurvisie ondergrond“), about which a first debate will be held in Parliament on 8 February. The vision notes that the importance of gas production from small fields will grow because of the caps placed on Groningen. 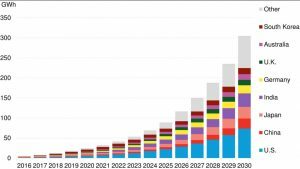 It also assumes an expected production of 10 bcm per year from small fields by 2030, which is “way too optimistic”, according to Van den Beukel. The national broadcasting company NOS reported on 5 Februrary 2017 that “resistance against gas production is growing all over the country”. It is quite clear that gas will be needed for quite some time. Whether one likes it or not, developing new infrastructure takes time and I don’t believe that many people will accept the consequences of not having enough energy. Replacing Dutch gas by Russian gas does not improve the situation with regard to the pollution caused by burning it. Maybe Russian gas is cheaper price-wise but it certainly isn’t in political terms: dependence of import from outside the EU is not attractive. Independency is very attractive too, and it may be worthwile to pay the price for it. The problem is not that there is no gas left in the North Sea. However, the gas remains in smaller pockets and is more difficult to find and more costly to exploit. The choice is: pay more, or more dependency on import from outside the EU in a world which is rather unstable. Less import means more reliable supply. What means “more costly” in €’s and %’s? With “more costly”, I mean in €/boe. A smaller field requires more investment per unit of production. This applies particularly to fields that are far away from existing platforms and pipelines. Sorry, apparently I wasn’t clear. “More costly” means that the cost goes up. In €/boe, or whatever. All gas in the Dutch offshore that is more costly to produce (small pockets of gas and/or poor reservoir and/or far away from existing infrastructure) now runs an increasing risk of being left in the ground forever. What is needed is a lower government take on the production of these hydrocarbons. That is advantageous to our country, from a financial, environmental and energy security point of view. Quite some politicians and civil servants may privately agree but say it is a hard, if not impossible sell, in the current political climate. Thank you for your comment. It is clear that continuation of production in the NL offshore means a higher production cost. It would be interesting to see some sort of quantification, but it is certain, like you say in your one but last alinea, that there are several advantages to conuation of the production. Not the least is the point about energy security. Import of energy from outside the EU is far from secure and there is no reason to believe that this will get better soon. 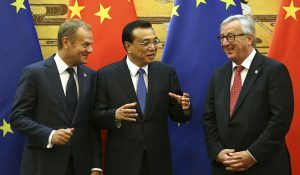 I could have written your last alinea myself, in relation to a a proposal we have made in order to realise one European market for electricity. 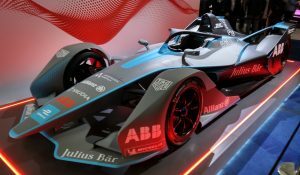 One of the things we wish to realise is to ensure that electricity will be produced without the need for import of fuels (Dutch gas doesn’t have to be imported!) 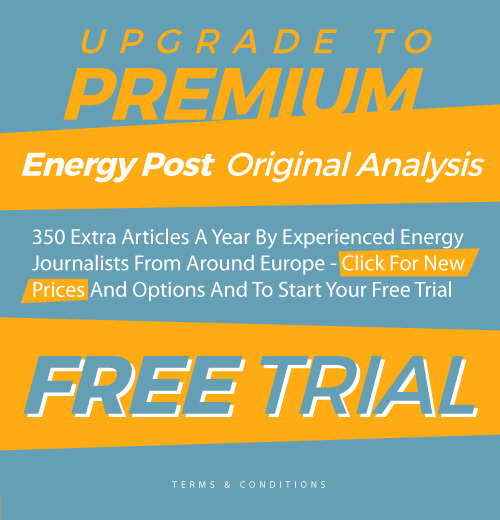 We have explained the proposal in https://energypost.eu/exclusive-overlay-network-telecom-experts-present-revolutionary-plan-integrate-eu-power-market/ , and we also get a lot of agreement. And we have the same problem with the political climate.